This recipe is prepared mostly for breakfast or dinner. Any noodles can be substituted instead of Rice noodles. 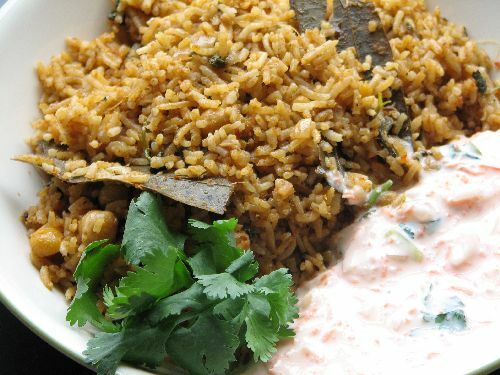 Vegetable biriyani prepared in dum method. Well, this turned out little messy as I over cooked the rice. When preparing rice for dum method, it shouldn’t be cooked more than half done. Channa Pulao tastes really good and a nice meal for any parties or potluck with small crowd. The rice fried in ghee and cooked with fresh tomato puree adds the taste.